again shows there’s a better way to frame. “You wouldn’t ask your mechanic to go to the local auto parts store and buy what he needs to build you a car from scratch. 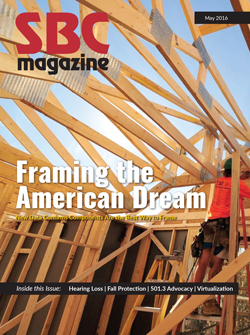 Yet that’s what builders ask stick-framers to do every day.” This is the analogy that runs through the head of Jason Blenker, president of Blenker Building Systems and one of the component manufacturers (CM) who helped spearhead the latest installment of SBCA’s Framing the American Dream (FAD) project this past October. FAD began over 20 years ago with the goal of gathering extensive comparative data between stick-framing and component framing. The idea was to quantify the differences between these two methods of constructing the structural framework of a building, to provide builders and CMs with benchmarks against which to measure their process and products. As Blenker points out, the data collected two decades ago and updated last year conclusively show there are several reasons why it doesn’t make sense for builders to stick frame. To fully appreciate the value of the FAD data, it’s important to look at where it came from, the market issues it aims to address and why Blenker and others think now is the perfect time for the industry to redouble its efforts in using FAD data to persuade builders still choosing to stick frame all or some of their projects that there is a more efficient way to use their labor while also building structurally superior buildings. In 1995, a 2,600 square foot, two-story floorplan was chosen for the study (see floor plan). In 2015 a 2,900 square foot ranch-style home with a walk-out basement was used (see floor plan). The FAD project set up two controlled experiments, one in 1995 in the parking lot of the Houston Astro Arena adjacent to the Houston Astrodome, and another 20 years later in a neighborhood in Jackson, Wisconsin. In each experiment, two identical buildings were framed, providing an apples-to-apples comparison of stick and component framing methods. The stick-framed house was constructed entirely onsite, while the other home was constructed using floor trusses, wall panels and roof trusses. To capture the value of leading-edge advances in the industry, the 1995 component-framed building included wall panels, a product few CMs sold at the time. In 2015, the floor trusses were pre-assembled into sheathed panels in the manufacturing plant and then shipped to the jobsite. In 1995, photos were taken from the roof of the Astro Arena and observers recorded worker tasks by hand. In 2015, wireless cameras continuously recorded images from adjacent jobsites. In both studies, workers’ movements were recorded throughout the framing process from foundation preparation through window and door installation. In both studies, once the two homes were fully framed and dried-in, the data was analyzed to reveal how many hours it took the workers to complete each discrete framing task (for example, installing the roof trusses versus assembling the roof rafters by hand) and how much waste was generated in the process. In addition, material invoices and component design layouts were reviewed to assess the wood material used to frame each home. Over the years, the 1995 data have helped CMs convince homebuilders to switch from stick framing to component framing. So why revisit the project? Simple. The most significant pain point builders talk about today is labor, and the latest iteration of FAD provides more in-depth data on that issue. After labor, raw material is the next biggest contributor to the overall cost of construction. The FAD data show builders that components are the most effective way to go “green”—by reducing the amount of wood needed to frame a building, components save trees and builders’ bottom line. This is significant because the lumber industry’s capacity to produce framing lumber is relatively fixed, so as homebuilders construct more homes, demand increases rapidly and prices rise accordingly. As was learned in 1996-1997, and again in the mid-2000s, when demand increased beyond the lumber industry’s capacity to produce, a housing boom can cause prices to fluctuate unpredictably and make profitability a significant challenge for builders. In the homebuilding industry, waste is a part of the process and homebuilders typically factor it into the cost of construction. Yet jobsite waste represents more than the cost of the unused product. Waste negatively affects productivity as everyone on the jobsite navigates around scrap. At some point, labor must be redirected from construction to waste collection. Finally, there is the cost of hauling the waste away. “Controlling costs on the jobsite by eliminating the generation of waste on the jobsite, even if it’s a couple hundred bucks, can make a big difference for a builder,” said Blenker. In 1995, and again in 2015, the FAD project yielded conclusive results. The component-framed building required significantly fewer hours to complete. In both studies, it took roughly two and a half times longer to construct the stick-framed version of the house. Another way to think about it: the FAD data suggest a crew could frame two and a half buildings using structural components in the same time it would take that same crew to stick frame one building. Further, stick framing requires the time and talent of a skilled carpenter. The amount of measuring, cutting and installing required on even average-sized houses like the ones in the FAD projects offers many opportunities for human error. Installing manufactured structural components, on the other hand, drastically lowers the opportunity for error and significantly reduces the level of expertise necessary for the construction crew. In terms of overall materials, the stick-framed buildings used significantly more board feet of wood than the component-framed buildings. The FAD data also show a clear difference in material efficiency between the two framing methods. In 1995, the stick-framed building required 35 percent more wood than the component-framed building to accomplish the same framing task. In 2015, stick framing required 37 percent more wood. This increase in material efficiency likely has a lot to do with advancements over the intervening 20 years in truss design software and truss technicians’ ability to optimize designs for both roof and floor trusses. Finally, the component-framed buildings produced very little jobsite waste. In 1995 it was 4 cubic yards, and in 2015 it was only half a cubic yard. The stick-framed buildings produced approximately 17 cubic yards in 1995 and 15 cubic yards in 2015. That’s the difference between hauling away a dumpster and needing only a few trash cans. SBCA shared the 1995 FAD data in the media most prevalent at that time: brochures and videos. In 2015, online dissemination of the FAD data is the most effective approach. 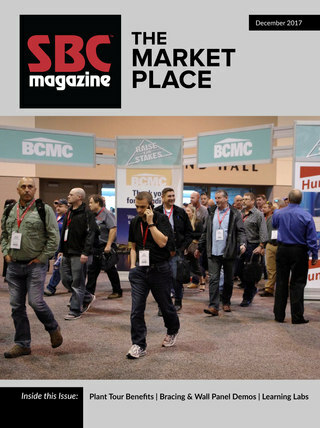 (Visit sbcindustry.com/fad to access the latest marketing materials.) In addition, we’ll soon post a series of one-minute videos highlighting differences between the two framing methods. About the Author: Sean Shields has been managing editor of SBC Magazine since 2010 and is also director of communications for SBCA. He’s focused on helping CMs grow their market share since joining SBCA in 2004. Virtualization: Is Your Business Ready for It?